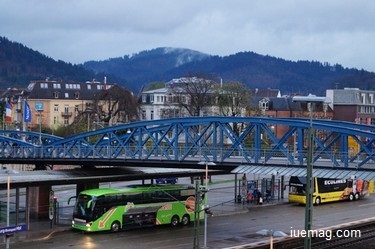 The best ‘good mornings’ in the world are known to be the ones at Freiburg, the famous gateway to the Black Forest. Also known as ‘Schwarzwald’,a large part of the forests are spread in the state of Baden Wuttemberg, in the upper Rhine plain, south west of Germany. Freiburg is a historic town nestled in the heart of Nature. To get to all the interior destinations in the black forest – Triberg, Titisee, the snow clad peaks of Feldberg, Hausach and more, one would most certainly pass through the beautiful town of Freiburg. Once inside, these towns in the Black forest feel fundamentally different from all the others in some way, I thought- feeling a difference while being unable to express it. We were housed in a Forest guest house, located quiet deeply into the woods, almost to my fears. Pure serenity has a certain charm of enrapturing the sensitive soul. Travelling deep into unknown places, more so amidst nature, proves to you a very basic tenet of happiness - living without expectations. A liberating sense of peace comes when living in the moment, free from expectations from the times to come. On a scenic train journey towards Triberg, alongside the sights of Steam engines, castles and mountains, one passes through a very charming small town called Hausach. Completely enamoured by its rustic appeal and its vast green trails, that we abruptly decided to alight the train and walk along on the way back. With not more than 5000 people, the people of Hausach are very simple and calm in demeanour. They always talk to you with a smile. Unlike in the big cities, the smiles here seemed to come from deep within. Hausach is set on the banks of a steady stream, with an elegant cathedral on one side, quite gothic in architecture and a historic fort on a mountain summit on the other side. The stream flows all along the village. To make sure one stays on a right course, it is best to follow the stream. After a while, the lanscape transitions into a multitude of veridian hills on either sides with spacious lush green trails adjacent to the stream. The vastness of the place makes you feel quite small. The tree cover was uniformly thick, with multiple hues of green. Some houses are built amidst very artistic segments of levelled circular flatlands along the gradient of the hill. One would sure want to retire here. The vibes of the whole place are quite meditative. You will see a very suavely dressed Sheperd grazing his Sheep in true German style. Even the Sheep in Germany follow almost an army like order and discipline. They fall perfectly in a line and the distance between any two of them –even between adjacent rows look exactly the same. The Sheperd employs an actual ‘Watch dog’ to monitor the sheep. One wrong step and the watch dog runs to that Sheep, to set the symmetries right. Maybe the expression, ‘Watch dog, came from here! Some distance further, you will spot a ‘Hundeschule’ (A school for dogs). There are classes and the dogs have to pass some running tests as well! ) to train the dogs to supervise herds of sheep. Somewhere along the way, I spotted this on the bridge. 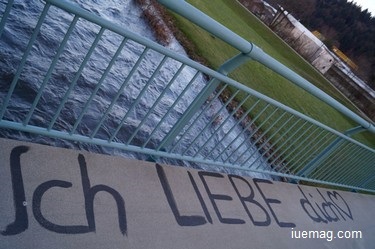 Ich liebe dich –‘I love you’. The views of the Sunset and Hausach from the bridge were simply picture perfect. Of course, the romantics here want to draw complete leverage from it all. I checked with a German colleague when I returned. He said, “Diese Anlage ist ganz bekannt. Viele heiratsanträge sind hier stattgefunden” (This place is famous. Many marriage proposals were made here). Well, I can only imagine all replies to have been in the affirmative, for any man who were to go down on his knees here. Love and Nature have a very deep relationship. To Love is our nature and Nature is Love itself. We had walked far. Time seemed to stand still. The last golden rays of the dusk partially illuminated the hills. We made our long but lovely walk back to the train station. The magical shades of Orange over the hills in the Black forest completely charm you. Calm places make the mind calm - and a calm mind is generally philosophical. Answers then, seem to come hooked at the end of every question. The Flag on the Hausach fort was still flying high. The church was illuminated from within, appearing to have a certain glow of the divine. By now I understood the difference-what set these places apart. The only prominent sounds here, are the sounds of nature. 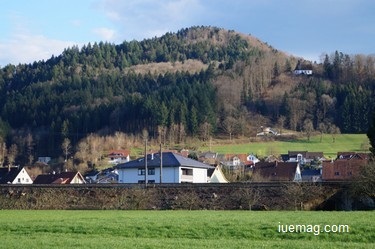 An iconic interplay of sound and silence forms the very character of Schwarzwald. The fractal symmetry in a flower, the sachet of the vapours from a waterfall, the rhythm of the flowing stream and impressions of that sanctity in its people. An adventure in Schwarzwald is a quest for beauty. Find time to listen to Nature’s stories. They are just everywhere. Just make sure to have a Black forest cake in the mean time! Srikrishna Chaitanya is a contributing writer at Inspiration Unlimited eMagazine.